?Capitalism is also a room, but there are caimans, poiso?I always compare socialism and capitalism to two rooms. Socialism is a room with a solid floor, without traps or holes, mines, or quicksand, but the ceiling is only at 1 meter, and you can?t go any higher.? says a young resident in Cuba today.nous snakes, spiders, mines, holes, traps, and only walls. There is no roof, you can climb as high as you want or can knowing that you may fall down forever. For a long time, the state protected the Cubans from this fall, but without allowing them to climb up.? The words come from a documentary entitled El Futuro Es Hoy (The Future is Today). Strong words from a resident who has recently seen half a million layoffs in 2011 and is now immersed in a new Cuban society with hundreds of thousands new business licenses granted by the government encouraging small business enterprises. Ultimately, it?s a transition from ?The State? to the ?Individual? for Cuba in 2011? entering the mouth of capitalism? and they?re not afraid of it. Although the documentary, was released in 2009 by Canal Documental TV, it?s still a pretty good ride into the mind of modern day Cuba. The premise is simple, follow 7 residents of Cuba in 2007. The conversations with Director Sandra G?mez feel quite open-hearted and natural. ?Everyone is on standby? says another character, ?a waiting period to see how the game ends?. Says another character in the doc: ?The Cubans could have more freedom and more choice. I think we are not used to making decisions. At the beginning many people will abstain. But perhaps it?ll be the opposite. After so many years with a leader deciding on the fate of the nation, we may accept that we are grown up, and decide that it is time to choose for ourselves what we really want to do.? In any case, the film is a fine specimen of current ?word on the street? today in Cuba. It?s not an angry film, nor is it confrontational? it is simply honest, heartfelt, and melancholic in nature. Director Sandra G?mez has managed to accomplish something quite difficult, that is to show both the joyous complexity of Cuban culture mixed with the hardships and conundrums that the Cuban revolution has presented to a generation in transition. The title of the film, The Future is Today, resonates more this month now that the Congress of the Communist Party is convening literally this month in Cuba. The local Cubans are waiting baited breath for further reforms to be announced mid month. To see the full movie in Spanish (running time 35 minutes), go to El Futuro Es Hoy on Vimeo. Life in Havana, suspended in a state of waiting. For the first time since the revolution, Fidel Castro is not in power. Seven people express their complementary yet contradictory ideas. Some would like things to carry on as they are, while others hope for change. All seven are associated with the Malec?n, Havana’s famous sea wall, where the city opens out to the horizon. Sandra Gomez was born 1976 in Havana, Cuba. Sandra graduated in 2004 at the Film School “Escuela de Cine y Television, San Antonio de los Ba?os”, Havana, as Director of Photography. She has been living in Switzerland since 2005. Sandra is currently developing “Children of the Night”: The story of children whose skin cannot be exposed to sunlight as this would have lethal consequences. Their daily routines shifted to night-time, their desperation and moments of joy, their fragile existence. In my documentary “The Future is Now”, I tried to influence the characters’ behaviour as little as possible. This also holds true for the interviews: the characters were encouraged to express themselves freely. The result is a film with seven characters: a fisherman, a security guard, a writer, a doctor/rocker, a mother and son who live at the Malec?n, two children and a man who has pitched his tent on the waterfront. All the characters complement, strengthen and contradict one another. 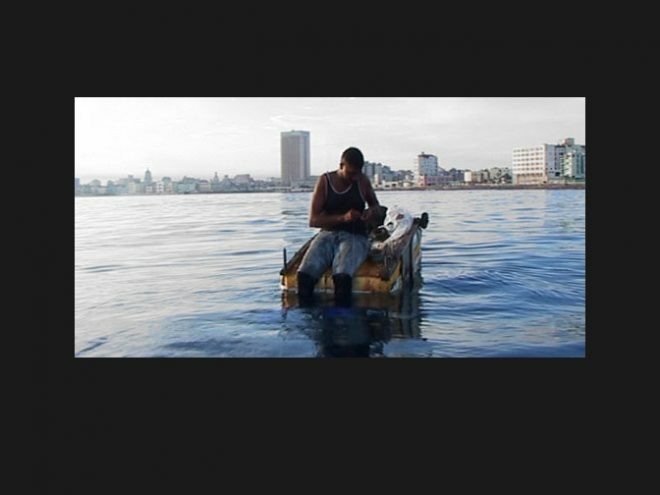 The variety of views expressed in the film is important to me, as I believe it reflects reality of life for Cubans who at this moment in time have conflicting ideas. Some of them are hoping for change while others would like things to continue as they have been and still are. Although it is impossible to see with someone else’s eyes, I was interested in showing each character’s situation and hopes for the future through their own eyes and allowing the audience to draw their own conclusions. In these historic times, when opposing attitudes are vehemently expressed within a society, there arises a risk of division. The mother and son who live at the Malec?n, for instance, have contrary views. From the outset, I chose characters who were in some form or another associated with the Malec?n. The final scene, in which they are all united at this location, is an image which I had not envisioned from the outset, but now concludes the film like a hope – maybe utopian – that Cuban society can remain united.